Batik is a very popular tourist souvenir in Yogyakarta and its motifs are full of the meaning and philosophy of life. In the past, these decorations were only used by the Royal family and the people who have a certain social status. For Now, Batik is souvenir when you visiting Yogyakarta. Batik is an art process well known in the island of Java in Indonesia. The word 'Batik' originates from the Javanese tik and means 'to dot'. It is a manual process with the use of fabric, hot wax, tjanting and colors. Tjanting is a bell metal tool used in outlining the design of the batik art. Batik motif differs based on the person and use. The Batik process of Yogyakarta is a preservation of authentic Batiks, produced either hand made or by stamp. Usually, hand made batiks are done by the ladies and stamps by men. Printing is not encouraged in the Batik business because it might destroy the traditional method of producing authentic Batiks. 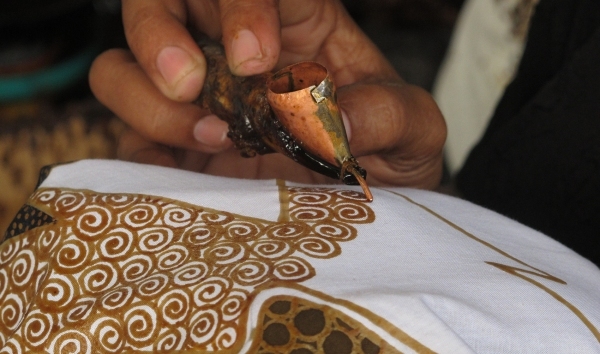 During your trip in Yogyakarta, fill your time to learn to making batik with yourself. Feel a different experience making batik process learn from native people. To make it happen, you can visit Museum Batik Yogyakarta. Founded in 1979, Museum Batik Yogyakarta has a collection of various Batik styles from Yogyakarta, Solo, Central Java, Pasisiran as well as tools and equipment used in Batik making. You can get experience how to make the batik in the museum. Proper way of making batik art will be explained right before you start creating one. Be careful with the hot bee wax and just enjoy using tjanting. Don’t get frustrated when you messed up your work with droplets of wax since everyone does the same.